Nashville-based artist Vadis Turner explores the transformative possibilities of feminist materials by creating compositions out of upcycled ribbon, clothing and bedding. By synthesizing abstract expressionism with women’s work, Turner constructs dimensional art works that explode with color, texture and form. Not unlike painting, each “mark” is hand sewn onto woven foundations, draped on a model, or suspended in resin. 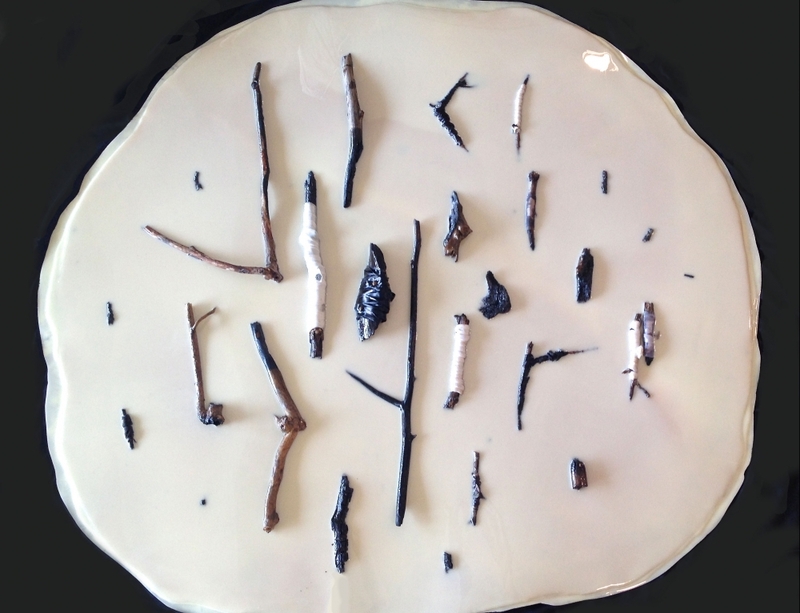 In her latest series, Turner incorporates many new materials including acrylic resin, breast milk, charred sticks and ash. By coating skeins of soft of textiles with a slick shell of resin, her works take on the new quality of a wall relief. Turner’s current exhibition at Geary Contemporary, “Bells + Burn Piles” (on view until October 8th) celebrates the feminine and the maternal through a simultaneous deconstruction and rebirth of the pregnant bell form. Quite fittingly, works range from robust compositions saturated with juicy reds and Yves Klein blues, to cooler toned works encrusted with bone white, frosted pink, and dove grey. Heather Zises: What kind of themes and/or narratives do you pursue in your work? Vadis Turner: I transform feminist materials into abstract works. My compositions are created from partnering female characters with their changing environments. HZ: Can you explain a little bit about your process? For example, how do you start a work: with a concept or with an image, or perhaps both? VT: One work inspires ideas for the next. I keep a list of descriptive words near me while I work. The words evolve into a concept and I start to make a lot of bad drawings in order to I develop compositional priorities. Then I make “haystacks” out of scraps of ribbon or materials to create corresponding color palettes. Sometimes I go back to the drawings to make them look more like the haystacks as I often find beauty in the accidents. Then I will make an under painting on a textile or acrylic foundation before I start applying layers of material. I make collages throughout my process as a way to simplify information or see through an extension of an idea. HZ: You studied Painting as an undergrad at Boston University and have an MFA in Studio Teaching from BU as well. How did your painter’s studio transition into an atelier in which you are now fashioning works out of fabric and ribbons? VT: I had a lot of voices in my head when I graduated (which I now value). In 2000, I spent some time at home in Nashville, before moving to New York, where I took a break from painting and started to experiment with supplies I found in my mother’s kitchen. I made prom dresses and naughty lingerie out of wax paper. I loved how manipulating the mundane could alter our perception of materials we use everyday. I worked with tampons, tabloid magazines, quilts, etc. and eventually developed a palette of materials that related to women’s work that could transcend into vehicles for my ideas. In 2011, I wanted to return to painting. The challenge came in creating brush marks, color fields and drips with bedding and ribbon. HZ: For your current solo show “Bells + Burn Piles” at Geary Contemporary, you introduced a myriad of unorthodox materials into your stable of ribbons and fabric such as breast milk, ash and charred sticks. What inspired this variation? This process also (seemingly) led to placing works in less conventional places like the floor…was that intentional or unintentional? VT: The resin and ribbon wall works describe a progression from bell to burn pile. This body of work addresses the activity and ultimate dormancy of my fertility. Bells are vessels that have the potential to project sound and energy even in stillness. I also use the “bells” to reference the womb and the heads of my sons. I introduce ashes and charred bits into the works as they slowly transition into burn piles that represent destruction and renewal. Large piles of broken branches are scattered about the landscape where I live in rural Tennessee. I wanted to make an installation that engaged the burn piles. I wrestled with large limbs for weeks before I realized that I was most interested in what remained after the branches had burned. I collected charred sticks after the bonfires had died down and wrapped some of the pieces in ribbon. I mixed the resin with breast milk and paint to create a pool or puddle for the arrangements of burnt pieces. One composition captures the remains of the fire while the second compositions shows them separated as artifacts/bones/specimens. Both burn piles and puddles have a physical relationship to the ground and it was important to me that the works maintain that relationship, which is why they are presented on the floor. HZ: Is there a particular work in the new series that is particularly meaningful for you? VT: I am very proud of this show and especially excited about the breast milk puddles. “Artifacts” is the final work I made for the show and I look forward to using it as a departure point. I am working on a third one where the artifacts start to relate to each other in pairs- like my boys. HZ: Who are some of your greatest influences? VT: I like to invent alternative endings and afterlives for tragic female characters from literature. Ophelia and Eve are two examples. I am also inspired by other female artists such as Kiki Smith, Petah Coyne, Joan Mitchel, Judith Scott, Beverly Semmes and Marilyn Minter to name a few. HZ: You participated in two artist residency programs in two years; in 2013 you were a resident at the Museum of Arts and Design, and in 2014 you were a resident at The Wythe Hotel in Williamsburg, Brooklyn. How were these programs different from one another and what did you come away with from each one? VT: They were wildly different, but both great experiences. The Wythe offered an in-house residency where I got to stay in the rooms to make work. The works I exhibited on the main floor were the same proportions to the windows of the hotel that were serendipitously similar proportions to Monet’s Rouen Cathedral Series. I created a three-part series of textile works and a selection of collages that depicted the light and compositional changes of Manhattan (seen from Brooklyn) at different times of day. During the Studio Program at MAD, I collaborated with artist and friend Saya Woolfalk. We focused on the communal rituals of craft making and hosted regular crafting sessions for museum visitors. Hundreds of participants helped to produce that we used to create ceremonial dress and performative props as part of a multi generational collaboration with our children. HZ: Tell us about your upcoming museum exhibition (Spring 2017) “Tempest” at the Frist Center for the Visual Arts in Nashville. VT: Each of the three rooms will be dedicated to a different chapter in a woman’s life: The Wild Woman, The Mother and The Elder. There will be a disturbance introduced to each chapter, for example, the Wild Woman will face a storm, the Mother will face a burn pile and the Elder will face silence. In a few weeks, I will start working on the Elder room. I will lead a series of conversations with elderly women and their families that identify and invigorate the legacies they are passing on to the next generation. After collecting the wisdoms of female elders in my community, I will present their physical or conceptual heirlooms in a hand stitched wisdom line that encircles the third room of exhibition. HZ: Finally, what role do you see “feminism” playing in the future? Do you think it will always maintain a separate identity, or do you think there are possibilities that the paradigm will slowly dissolve over time? VT: As the sexes are inherently different, it will always be a distinct identity. And I am thankful for that. In time, I hope that feminism unites men and women in celebration of how women contribute to our culture.